Also known as bug out bag, emergency survival bag, or too lazy to unpack my hiking pack. Today we will cover the three most important things about the go bag, the bag itself, water, and food. The go bag is your emergency bag that is always loaded and ready for the next disaster. You can grab it and “go” at a moment’s notice and set out confidently into the Primal Age. One bag to save your life. 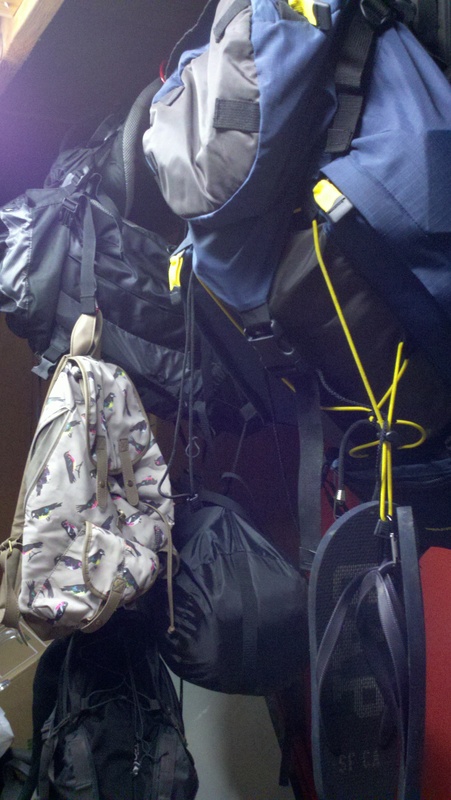 The common mental image of a go bag tends to be a duffel bag; however your best bet is a hiking pack. After all, they offer proper weight distribution via various straps, are water proof, and compartmentalized. The two key things when picking your pack is storage and weight. You want a pack that can hold at least 5,000 cubic inches (85 L). When it comes to weight every ounce your pack weights is one less ounce of supplies you are going to carry. Don’t sacrifice weight for quality, but a try to find a pack that is six pounds or less. Anymore most backpacks come with a bladder pouch. A bladder is a plastic reservoir, usually one or two liters, that is stored within your pack and has a nozzle and hose which clips to the front of your pack for easy access. This isn’t something you must have, but it does provide you the ability to drink in motion, which will come in handy. Here is a good example of a quality pack. First and foremost you need water. If your pack has a bladder keep it full (make sure to cycle your water out weekly). Whether it has a bladder or not, make sure all water bottle pouches are full with the largest and lightest bottle you can find. As necessary as water is to your life, it comes with the price of weight. A gallon of water weighs 8.34 pounds. I suggest carrying 2 gallons of water in 2-4 containers which before container weight is nearly 17 pounds. *A cheap solution for bottles are 2 liter soda bottles. Still on the topic of water, you may ask what happens when I run out? Well, you dehydrate and eventually die, which is why you don’t let yourself run out. Since any water you’ve ever drank out of a tap has been treated and filtered we don’t have a strong enough immune system to just dip the bottle in a river and drink it. There are four commonly used treatment tactics; UV, pump filter, iodine, and boiling. UV is the most sophisticated of these, however I advise against it since it relies on power. Boiling is the most primitive, and should always be an option, however not your primary. Iodine tablets are light weight and take up very little space in your bag. All you do is drop one in your bottle, let it do its thing, and drink up. The issue with them is you can’t carry an infinite supply. A filter hand pump takes up more room and weight than iodine tables, but is my suggestion for your primary choice. A filter can treat more water than the same weights worth of tablets. When it comes to your go bag, I like a rule of threes. Three different water bottles. Three different treatment options. I advise having a pump filter(with a few spare filters) with Iodine as a backup, and boiling as your choice whenever it can be. This way if your pump breaks you can ditch it along with the filters and keep going on the iodine tablets, and worst case scenario you can boil it. *Also keep in mind the abundance of bottled water in today’s world. Any time you can scavenge safely do so. With food you want the most calories for the least weight. A human body at rest burns 1,500 calories a day. Each mile covered on foot is an additional 100 calories. So, now isn’t the time to worry about nutrition. Military MRE’s are your best option; however they aren’t cheap and easily scavenged. Protein bars and other similar items are great options. Pop Tarts are a common go to for hikers since they are 200 calories per pastry. Make sure whatever foods you choose are nonperishables. One great way to boost your calories is by using protein mixes and other similar products. By adding them to your water supplies, you can continually keep a calorie intake while in motion. These do not replace the need for solid food and should only be used in addition. Now I’m sure there are more scientific formulas than this one, but this is my simple layman’s set up. A pound of fat requires 3000 calories to burn, and you don’t want to lose more than three pounds a week. So if my destination is 80 miles away, and I plan to do that in 7 days my consumption would be 8,000 calories in transit and 10,500 calories for the days for 18,500 calories, minus the flex 9,000 for the three pounds you can sacrifice, leaves you at 9,500 calories to be sure you can survive. I use that example because I strongly recommend not only having that many calories, but that sort of foot travel time line. Remember, same with water, scavenge when the danger is low. You may be sitting at your computer thinking that seems like an abundance of food and water, but it won’t seem that way when you are running out. If there are any areas to have too much of it is food and water. The other thing to keep in mind is that for every twenty people to read this maybe one will actually have a go bag, and a topic to come will be forming a survival team, so you want be able to share if the situation calls for it. On a side tangent you should keep an emergency bag always prepped and loaded whether or not you say it’s for the Primal Age. There are plenty of less than end of the world situations that they become valuable. Cotton Kills. Avoid cotton for all your clothing choices. You have many options for shoes but sandals are not one of them. Leave the open toed shoes out of the Primal Age. The biggest thing with the shoe is make sure they fit and are broken in. Take it from me, climbing mountains with bleeding feet gets old fast. You want the shoes to be waterproof yet breathable. Know your body’s strengths and weakness when picking a shoe. If your ankles roll easily, go with a high topped hiking boot. If you can leap from rock to rock with ease a solid trail running shoe with a rock plate is probably a wise pick. I suggest shying away from steel toed working boots, just because they are not as conducive to running, but if they are your thing that’s your choice. Make sure with whatever shoes you pick they are practical and comfortable. Socks. Take a high sock that is either synthetic or smart wool. This offers a little extra protection to your lower leg and also will wick moisture and heat away from your feet. DO NOT WEAR COTTON SOCKS. Inner shell. This covers tops and bottoms. The inner shell is your second skin. This is a good time for dry fit clothing, because it helps keep the elements away and also removes sweat and excess heat. When it comes to tops I suggest going long sleeve just for optimum coverage, but if you’re a shirt or no sleeves fan, that’s your call since this layer should never be on top. On your lower half pick your favorite brand of compression shorts. Female articles…I’m not that stupid to post anything on that. No matter what I say I’ll be wrong. Female survivalists feel free to add this info in the comments. Gloves. These are mostly dependent on your climate and season but a pair of gloves should always be worn. Keep in mind you never want to be too hot, you want to be able to move all five digits, and you want as much touch sensitivity as possible. Good test for this is if you can tie you shoes with your gloves on, you may have a winner. Hats are something you should always wear. Baseball caps offer sun protection. Beanies offer warmth. With the amount of variety in hats it’s a matter of matching your wants with your needs. Find some that work for you and break them in. These are also a big factor in your Primal Age “look” but that will come later. Eye glasses/sun glasses. If you wear contacts now you want glasses for later. Even if you carry your weight in contacts you’ll run out sooner or later. Also a backup set of glasses is always wise. Even if you don’t need glasses, sun glasses are a great thing to bring along. Make sure they are the type that will fit to your face and not fall off easily when running. Other than that the choice is yours. These options vary greatly based on your location and season. Since I’m going to talk about inner shells later as a group, I’m going to look at this as if we are talking about as a primary shirt and not something you are wearing under a coat or jacket. A topic that hasn’t been talked about yet but is important with clothing is breathability. Something that wicks sweat away from the body and helps disperse excess heat is an important consideration. Your primary shirt should always be a long sleeve. Exposed flesh is like holding a t-bone steak in front of a dog and then wondering why he ate it. Even in a Primal Age without zombies you should still keep your arms covered. There are plenty of other things that can kill you and long sleeves provide protection to the sun, wind, cold, water, snow, and brush. Feel free to get a long sleeve that you can roll up for versatility. Also, I know many of you are thinking I’ve got a great long sleeve Under Armour, now isn’t the right time to bring that out. A second skin is not recommended as a primary shirt because of the lack of pockets. A primary that isn’t skin tight allows for an inner shell to be worn under. A collar on your primary shirt goes a long way. Think about how annoying sunburn is now when your life isn’t on the line every moment of every day. Be smart, don’t red neck. Thank you to everyone who participated in this little competition by either posting or voting on the name. I have to say I quite enjoyed the horse race that took place between all four of these names which each held a lead at some point in the voting process. Sadly there was no tie, because I had come up with a fun mortal combat fatality style death match to pick the winner. However, the masses have spoken and selected a favorite. The name of the cub, as recommended by Kait Burrier, is Bristle. Please join me in welcoming her to the Primal Age family.